It's an awesome game! You get to ride around the world of Bella Sara, collecting horseshoes. Horseshoes is the currency and you use it to buy things. 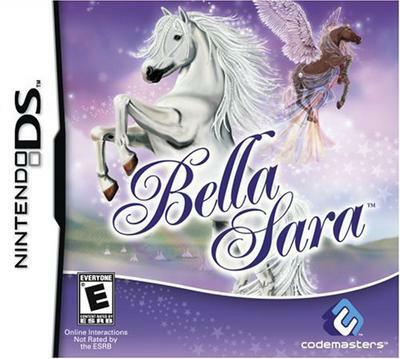 You don't necessarily need to buy the game to play Bella Sara. You can also play it online! You don't really have to but this is the fun part: in some stores, they sell card packs of Bella Sara. In the game, you get a bonus: it says on the back that you get free activation codes when you're playing! Also, you make friends with 5 beautiful horses, and you ride around with them and take care of them. I really recommend this game for younger girls who love horses and ponies. I find it a really nice game. Oh... You can create your very own foal online too. You can choose from either girl or boy, then you can pick the foal and name it. It's really fun and it is a great game! i have finished the game a lot of times and i some times go back and read the cards my favorites are juno, amor, angel, naiad, nike, roxy, tao, aphaia, don, echo, embarr, nanna, flame, grey, halloween, hera hestia, luna, misty, moonlight, rhiannon, rimfaxe, santos sarah, sasha, thalia, urania, vesta, yasmin. Where i can download this game free? i like it because i love horses!